Offering higher throughputs and pressures, Maag’s vacorex discharge and thermorex transfer pumps provide immediate effect in performance classes GP, HV and HP for the manufacture of polymers. The vacorex series comprises sizes 45 to 560, where as the thermorex series come in sizes from 45 to 360. The latter can be integrated as transfer or booster models into the transfer pipe (“in-line”) or directly onto the mixer. 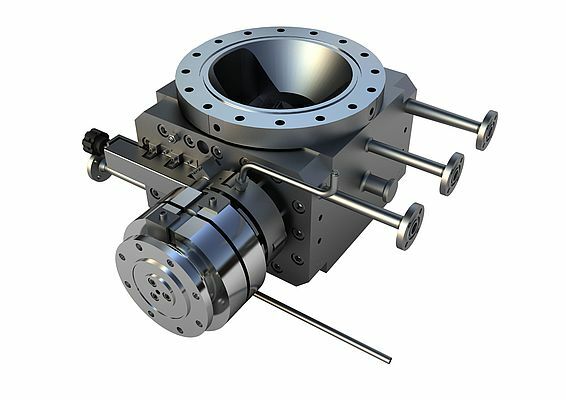 They both feature compact construction, optimized geometries to ensure good filling properties and a special gearing system with low squeeze effects for gentle handling of polymer melts. The carrier materials can be heated continuously to up to 350 °C to influence their viscosity, yielding viscosities up to 20,000 Pas. The shaft seals, gear and bearing technology ensures minimum friction while guaranteeing high level of efficiency. The two series offer low pulsation transport even at high differential pressures. Highly reliable, the GP version boasts increased emergency running properties thanks to its modified bearing and gear geometries. It is available for all sizes in both series and is used for standard applications with pressure differentials of up to 250 bar. Offering higher material throughputs, the HV version provides 25% higher filling volume than the GP version. Featuring a small footprint, it can be used in applications with process pressure of up to 200 bar differential pressure. In the standard range, the pump is available from size 140 upwards. The top-of-the-range model, the HP version, withstands process pressures of up to 300 bar differential pressure. Allowing the highest throughput among all of the versions, it is also available from size 140 in the company’s standard range.